Our new Radio-Signal Remote Hygrometer/Thermometer provides wireless readings of humidity and temperature, min/max memories, and high/low alarms. The main unit can receive humidity and temperature readings from up to 100 feet away via radio signals sent from remote wireless sensors. The radio signal eliminates the need of any cables. You can place the main unit at your desk, work bench, office or wherever you would like to be able to see the data. Place the remote sensor module in a lab, ducts, storage facilities, even outdoors. The remote sensor sends humidity and temperature signals to the main units digital display. The remote sensor transmits on a frequency of 433 MHz, that can penetrate through walls. The range limit is 65 to 100 feet, depending on the location and number of walls. The main unit can receive and display data from up to three different remote sensor modules. Data is updated and transmitted every 30 seconds. 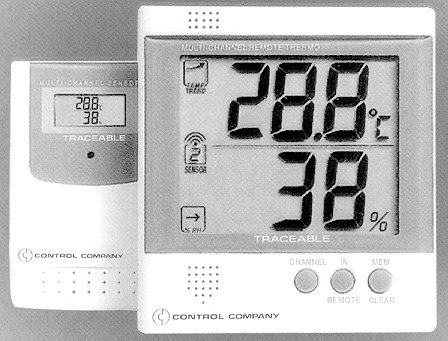 One of the features of the main units display is a trend indicator icon that shows for both RH and temperature whether humidity and/or temperature are rising or falling. Minimum and maximum memory display allows monitoring of conditions over short or long periods. An alarm may be set in increments of 1% RH and 1°F . The alarm sounds when the humidity or temperature rises above or falls below the high and low set points. Remember, you can have up to (3) three remote units all sending the above data information for each remote site back to the main display unit at one time. At any time, with the push of a single button, you can switch the main display unit to readout data from remote unit #1, #2 or #3. The main units jumbo display digits, 1-1/8 inches high, may be read from 25 feet. Take note that even the remote units have LCD readouts of both RH and Temperature. The cases are made of high-impact, chemical-resistant ABS plastic. Both the main and remote units are furnished with a flip-open stand, wall brackets, and Velcro to attach to any surface. The batteries will operate both units continuously for up to eight months. Each system is supplied complete with Traceable Certificate, one main unit, one remote sensor module, internal humidity sensors, internal temperature sensors, and two AA and two AAA alkaline batteries. Remember that you can buy up to two more remote units to work in conjunction with this system. The main unit measures 4-1/4” x 4-1/4” x ¾” and weights 6 ounces. The remote unit measures 2-1/3” x 3-1/2” x ¾” and weight just 3 ounces.